With the above brief description of forest processes, it is now possible to explore how the forest landscape patterns evolve in a real world situation. To do this, the Gray's River watershed will be used as an example. The Gray's River watershed is located about 20 miles from the coast of southwest Washington in Pacific, Cowlitz, and Wahkiakum Counties, (Figure 7) and encompasses a total of 79,635 acres (124.43 sq miles). In the upper watershed, an estimated 95% of the land is owned by private timber companies. In the lower watershed, an estimated 85% of the land is owned by private small land owners. Public lands held by the State of Washington represent about 5% of total land area within the watershed. There are 13 miles of paved state highway, and 62 miles of paved county road within the watershed. The majority of the watershed's rural population of 245 live in or close to the town of Gray's River, Washington. The watershed consists of 1,298 miles of dendritic stream channel that drain southwesterly to the Columbia River. The Gray's River watershed has an average density of 10.8 miles of stream channel per square mile. The watershed ranges in elevation from sea-level in the southwest to 3,800 feet above sea-level in the rugged headlands at K-O Peak in the northeast. The lower reach of the Gray's River meanders through a 2,758 acre, flat meadow at the southwest corner of the watershed (Figure 8). The meadow occupies the valley floor, extending to the forest edge adjacent to the valley walls. In the more rugged upper reaches of the Gray's River the coniferous forest has historically grown right to the river's edge. In the lower watershed, the lateral movement of the free flowing river across the valley floor has effectively kept the coniferous forest in contest with meadow for being the dominant land cover. The Gray's River watershed forest once consisted of 76,451 acres of old-growth. According to Franklin and Dyrness (1969) the original Gray's River forest can be split into two distinct forest types (Figure 9). The sitka-spruce zone occupies approximately 30,080 acres or 37% of the watershed in the lower elevations including the meadow land. The dominant species of this zone, in order of abundance, are sitka spruce, western hemlock, and Douglas-fir. Regionally in Western Washington, this narrow belt extends from the Pacific Ocean into adjacent river valleys and can be characterized by close proximity to the ocean, mild temperatures, 60-80 inches annual precipitation (Appendix D), and frequent summer fog. The western hemlock forest zone occupies approximately 49,555 acres or 62% of the watershed in the steeper slopes in the higher elevations of the watershed. This zone is described as a wet maritime climate with 80-120 inches of precipitation per year. The forest consists predominantly of Douglas-fir, western hemlock, and western red cedar. Hardwoods such as red alder (Alnus rubra), big-leaf maple (Acer macrophyllum), and golden chinkapin (Castanopsis chrysophylla) are found only in disturbed areas in both sitka spruce or western hemlock forest zones (Franklin and Dyrness 1969). There are many potential changes that can occur in a forest landscape over time. This study focuses on the evolution, extent and age characteristics of the modern forest landscape of the Gray's River watershed. In this chapter data will be presented to monitor tree harvesting patterns and changes that have occurred in forest cover over the past almost 100 years. Data sources include historical aerial photos, literature on forest history, and information obtained from local observers. Forest age information presented in this study can help in understanding the historic timber harvest scenario in the Gray's River watershed. The next chapter will evaluate the likely patterns of forest, cutting and change in the 21st century within light of the present forest, and make some recommendations for future forest management. A widely used method for characterizing forest growth is to inventory the forest and classify it into stands based on age. The underlying assumption is that the environment being examined consists of identifiable seres, or stands of even-aged trees. The use of stand age allows identification of where a stand fits in the regional succession of vegetation, or the seral stage of the stand. Thus, a young-aged stand represents an early-seral stage and an older stand represents an older seral stage. In this approach, variation in the characteristics of forest growth, age, structure, and composition can be generalized into groups, such as early, middle, and late seral stages. The Washington Department of Natural Resources Forest Practice Rules Board has established a four-stage seral classification scheme to describe forests in the State of Washington. Table 1 lists a modified version of the Washington DNR forest categories used to evaluate forest changes for this study. The modified version adds a fifth stage by breaking out old-growth from late seral. Table 1. Seral Stage classification system used in this study (modified from WADNR 1998). This study maps the Gray's River landscape in terms of forest and non-forest land cover. These two categories were generalized from a total of 50 categories of land cover (Appendix E). Of the 50, 43 are forest classes and the remaining 7 are non-forest. The 50 categories were mapped from interpretations of air-photo and ortho-photo quadrangle sources (Appendix F). The interpretations were made for eight points in time. Comparisons from one measurement date to the next allows us to determine the extent of forest gain or loss within the given time span. Combining the incremental changes allows the detection of an overall trend of forest loss. Map data created for this project are intended to quantify changes based on age relationships between timber stands within the Gray's River watershed back to 1905. More detailed analysis focuses on the period between 1942 and 1996, a time frame chosen because it represents the range of available air-photo data coverage. The two air-photos in Figure 10 illustrate an example of the kind of forest changes readily identifiable from data used in this study. The maps and the location and extent of timber harvesting can be best understood within the context of changes in the technology of timber exploitation. To aid in this understanding, the following narrative will weave together elements of cultural resource demands, technological change, and mapped patterns of forest cutting. The first human occupation in the forests of the Pacific Northwest occurred more than 10,000 years ago. Overall, Native American influence on the forest was minimal because of low population numbers and reliance on only simple technology for exploiting the forest resources. Given the likely low-impact of Native American culture, we can assume that the forest structure and extent in this period essentially corresponded to that which would result from natural factors operating in the absence of human impact. The movement of European non-native American peoples to the Pacific Northwest began soon after the end of exploration by Lewis and Clark in 1806. European settlers were equipped with a higher level of technology than Native Americans and were therefore able to exploit the forest on a larger scale. Logging in the Pacific Northwest began in the 1840's along water bodies that were accessible by ship. Communities were established to support timber activity where local forest resources adjacent to shorelines were plentiful. Although commercial timber industry operations were underway in the Pacific Northwest by the late 1840's no commercial cutting occurred in the Gray's River until 1905 (Wirkkala 2001). Lacking any evidence to the contrary, this study assumes that the entire forest was old-growth prior to 1905 (Figure 11). Areas of disturbance that may have existed prior to 1905 are assumed to be largely natural rather than human-induced, and highly localized. The beginning of commercial logging in the Gray's River watershed was late when compared to other watersheds around the state. The most likely reason for the delay was that more accessible locations were able to supply the demand for timber resources. The first commercial logging in the Gray's River watershed was in 1905 by the Johnson Timber Company. This small operation was located on their timber lease in the center of the watershed and did not affect large sections of the watershed. The location of these timber leases (Figure 12) meant that this first timber operation leap-frogged eight miles into the middle of old-growth timber in the interior of the watershed (Wirkkala 2001). Critical to this operation was the use of three steam donkeys. These apparatus burn wood to produce energy to power a steel cable winch used to move large logs from stump to stream, where they could be floated down river to the mill (Figure 13). In the period following 1905 two technologies were important. In the stream, a tiered system of splash dams (Figure 14) delivered logs to lower reaches of the watershed. By backing up water, small reservoirs were formed where cut logs could be temporarily stored. The splash dam works with two doors that can be broken open, releasing the water and logs in a torrent. Splash dams were built in narrow gorges to create a log transportation system extending from the interior of the watershed to a small mill in Gray's River for processing. One of these dams was operated in the Gray's River by Crown-Kaizer between 1910 and 1930 (Wirkkala 2001). Although this kind of technology was primitive, it was very effective in moving large logs to a centralized collection site, known as a staging area. 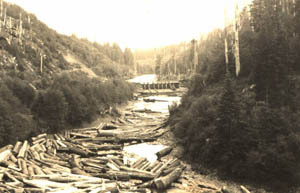 The first World War brought a second log moving technology to the Pacific Northwest that reduced dependence on the splash dam. With the advent of overhead cable systems, high-lead logging on steep slopes away from water became possible. Sophisticated overhead yarding methods were wide-spread in the Pacific Northwest by 1915. Overhead yarding permitted a longer cutting season and gave the logger a new kind of control over the movement of logs (Rajala 1998). The combination of these new technologies opened previously un-harvested forest upland to logging for the first time. R. Dwight Merrill of the Merrill and Ring Lumber Company in 1916 said, "that all the camps and mills now existing operating continuously can produce more lumber than the people of the world want to buy or the railroads and boats can handle" (Rajala 1989, 170). In this era timber prices were greatly depressed and causing production to decline. Logging in the Great Depression era slowed down as a result of the reduced demand for wood for fuel and building material. By the start of the depression coal and petroleum were increasingly being substituted for wood as energy (Rajala 1989). Wood was also giving way to brick, stone, cement, iron, and steel as a construction material, and by the 1930's competition from new materials had driven down prices in the lumber trade (Miller 1997). At the same time the economic downturn reduced the demand for wood as a construction material, adding to the economic stress of the timber industry. In 1937 an important turning point in forest history was reached. Up until this time, hemlock had not been commercially harvested because there was no market for it. In a saw-log based environment a higher market price was obtainable with Douglas-fir than with hemlock. This situation changed in 1937 when Rayonier Inc. began to use hemlock pulp to produce dissolved pulp (cellulose) for use in the rayon industry (Ficken 1983). This event now made hemlock an economically viable species and helped to revitalize the forest industry, spurring the exploitation of hemlock-rich stands that had previously been ignored. By 1942 (Figure 15) another 10,845 acres had been cut in the Gray's River watershed. After World War II forest harvest technology in the Pacific Northwest made another transition. Up to this time the technology for moving cut logs, although powerful, was reliant on streams and dragging on the ground. Timber supply was so great that only the most valuable species needed to be cut, which generally meant Douglas fir and, after 1937, hemlock. Following the war, bulldozers, skidders, and log-trucks became the standard tools used by the industry and this made it economically feasible to remove all the trees in a single operation. As a result mechanized equipment increased logging efficiency and logging practices changed dramatically. Selective cutting of a specific species was no longer necessary. 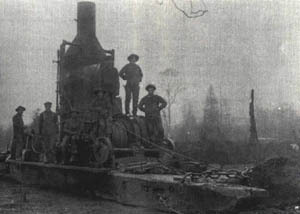 As a result of increased logging efficiency from mechanized equipment and increased timber demand after the war, logging practices changed dramatically. By the early 1950's mechanized logging operations had arrived in the Gray's River and both steam and diesel power were available to move the logs off the hillsides. In 1952 the first bridge across the Gray's River was constructed to allow log trucks access to a developing road network. Roads connected logging on the hill slopes with a staging area located just to the West of the watershed in the town of Deep River (see Figure 7). At the time, the unloading facility functioned so that log trucks could pull up and dump the load into the Deep River (Figure 16). The logs were then bound into log rafts, rafted down to the Columbia River and up-stream to Longview, Washington. 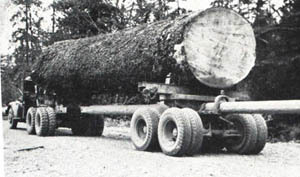 Most logs originating from the Gray's River in the 1950's-1970's were used in Weyerhaeuser plywood production (Wirkkala 2001). Logging patterns in 1953 show the natural forest landscape beginning to disappear (Figure 17). Aerial photography from 1953 indicates that between 1942 and 1953, 8,912 acres (12%) of the Gray's River forest was clear-cut. Of the 8,912 acres cut, 94.4% was old-growth. In 1953, the second-growth forest made up 41% of the total forest acreage and 38% of the Gray's River forest was less than 30 years old. At that point logging had claimed a total of 30,943 acres or 41% of the original old-growth forest. On Columbus Day, 1962 a major windstorm swept through the Pacific Northwest, blowing down millions of acres of trees (Rajala 1997). This literal "windfall" created a massive opportunity for salvage logging. Spurred by this abundant and inexpensive supply of timber, the growing Pacific Rim export market opened in 1962. The demands of this market drove a massive harvest effort to extract high value old-growth timber from upland areas (Figure 18). Between 1953 and 1964, 13,698 acres (18%) of the total forest acreage was clear-cut. Of the 13,698 acres cut, 97% was old-growth. In 1964, second-growth made up 60% of the total forest acreage and 44% of the Gray's River forest was less than 30 years old. At that point logging had claimed a total of 45,546 acres or 61% of the original old-growth forest. In the late 1960's and early 1970's timber harvests were expanded eastward to the steep Gray's River uplands. 1964 air photos indicate that the forest road network was extended to the northeast, providing access to the highest elevations of the watershed. By 1976, the forest road network in the Gray's River was developed to the point where it provided access to timber resources from all sides of the watershed. Between 1964 and 1976, 15,745 acres (21%) of the Gray's River forest was clear-cut. Of the 15,745 acres cut, 93 % was old-growth. In 1976 second-growth forest made up 83% of the total forest acreage and 53% of the Gray's River forest was less than 30 years old. In 1976 13,330 acres or 18% of the original old-growth forest remained (Figure 19). Clear-cutting continued to change the look of the forest landscape by extending the geometrically shaped patterns of the underlying land ownership to all corners of the watershed. Between 1976 and 1983, 15,805 acres (21%) of Gray's River forest was clear-cut. Of the 15,805 acres cut, 83% was old-growth. In 1976 13,330 acres of the original old-growth forest remained (Figure 19). In 1983, the 72,377 acres of second-growth forest made up 95% of the total forest acreage and 59% of the Gray's River forest was less than 30 years old. In 1983 4,099 acres or 5% of the original old-growth forest remained (Figure 20). By 1990 a total of 613 miles of forest roads had been constructed in the watershed resulting in a density of 4.9 miles of road for every square mile of land (Figure 21). If each 1990 logging road made a 55' wide treeless area then road building in the Gray's River watershed had taken away 4,086 acres (5.3%) of the total forest land. In 1990, the combined area of all logging roads was twice the combined area of all old-growth timber in the watershed. Between 1983 and 1990 a total of 9,593 acres (13%) of the total forest area in the watershed was clear-cut. Of the 9,593 acres cut, 40% was old-growth. In 1990, the 74,323 acres of second-growth forest made up 97% of the total forest acreage. In 1990, 54% of the Gray's River forest was less than 30 years old. In 1990 (Figure 22) only 2,156 acres (2%) of the original old-growth remained in the watershed. This period represents a decline in the total number of acres harvested per year and for the first time second-growth harvests exceeds old-growth. This resulted from the availability of mature second-growth cut prior to 1960 and greatly reduced availability of old-growth. These trees are getting older, but have not yet reached a state where they are merchantable. Between 1990 and 1996 6,106 acres (8%) of the total forest area in the watershed was clear-cut. Of the 6,106 acres cut, 20% was old-growth. In 1996 the second-growth forest consisted of 63,720 acres representing 98% of the total forest acreage. Only 20% of this second-growth forest was composed of late mid-seral (50-99 years old) trees. 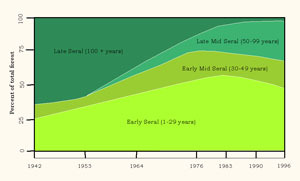 The remainder of the Gray's River second-growth forest was composed of 31% early mid-seral (30-49 years old) and 48% early-seral (1-29 year old). In 1996 (Figure 23) only 1,476 acres (2%) of old-growth timber remained in the Gray's River watershed. In the ninety-one year period between 1905 and 1996, 86% of the Gray's River old-growth forest has been logged. 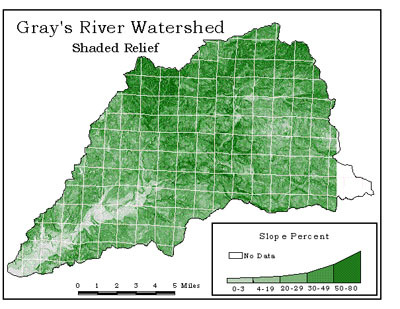 Figure 24 indicates Gray's River old-growth is functionally gone as a raw material for forest products, consisting of less than 2% (1,476 acres) of the watershed. Old-growth in 1996 existed as 400 individual fragments, ranging in size from 3.6 to 216 acres. By treating old-growth forest resources as if they were renewable, the Gray's River watershed has lost a valuable resource. Old-growth accounted for over 90% of the total average harvest from 1905 to the early 1980's. After that, old-growth resources became scarce in the Gray's River watershed. Logging in the Gray's River watershed reached its climax in the late 1970's when, on average, 2,258 acres of forest were removed per year (Table 2). One explanation for the higher than average harvest activity in the late 1970's may be a result of the uncertainty presented by the adoption of the Forest Practice Act in 1974. The Act established logging regulation that affected how and where logging could occur. Timber companies at the time may have interpreted the regulation as a threat to their own timber resources, resulting in the industry cutting all they could, while they could. Table 2. Average acres of annual harvest and forest type as a percentage of annual cut 1942-1996. A transition from cutting old-growth to cutting second-growth occurred in the early 1980's. The 1970's was the last decade where logging old-growth exceeded 50% of the total annual harvest acreage. By 1990, almost 60% of the average annual harvest acreage consisted of second-growth, and this figure rose to almost 80% by 1996. These forest harvest trends clearly indicate that the second and third generation forests now in place hold the key to the future of the watershed's ability to produce timber. In general we can say that the biotic complexity of the Gray's River Watershed coastal temperate rain forest has been dramatically altered as a result of timber harvesting. In the last century, the watershed has undergone an almost complete transformation from old-growth timberland to a simplified and fragmented forest. The present forest in the Gray's River looks and functions very differently from the way it did just 100 years ago. The 54,802 acres of old-growth forest that existed in 1942 has been reduced to 1,476 acres by 1996. Between 1942 and 1996, 92% of the forest area within the Gray's River watershed was clear-cut. In 1996, more than 1/2 of the 63,720 acres of second-growth was less than 30 years old. Modern forests generally rely heavily on energy intensive management including site modification, control of competing vegetation, genetic improvement, planting, and fertilization (Harris 1984). Still, a planned and managed timber stand may never take on all the characteristics of an old-growth ecosystem (Norse 1990). Modern forestry in the Gray's River watershed is clearly focused only on producing the highest value timber products in the shortest amount of time. As a result, the forest ecology and composition have changed to meet that one objective.